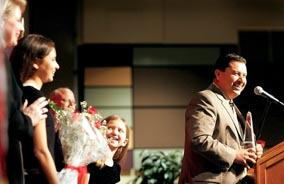 A surprised Frank Armijo was named the 2006 Tri-Citian of the Year on Saturday night before a cheering and applauding crowd of about 450 people, winning the award for a long record of community service. The recognition, announced at the annual award banquet at the Three Rivers Convention Center, came only a day after what’s likely Armijo’s biggest community achievement yet. He was saluted for leading the successful effort to win legislative approval for four-year status for Washington State University Tri-Cities. That single accomplishment stands to benefit the region for decades to come and put the Pasco native at the top of the list of community-minded nominees for the award. Armijo credited his parents for creating a loving environment under which he could flourish. He brought both of them on stage with him, where he also was joined by his wife Sherry and two daughters, Alexis and Rachel. He was nominated for the award by his longtime friend, attorney Fran Forgette. As the vice chairman of TRIDEC’s Higher Education Committee in 2005, Armijo led an effort begun more than a year ago to unify the vision for a four-year college to serve the region. Most of the work was accomplished under a tight seven-month deadline, culminating with Senate approval Friday of legislation that now awaits Gov. Chris Gregoire’s promised signature. TRIDEC President Carl Adrian found it fitting that Armijo accepted the award one day after learning of the bill’s success. Armijo’s effort in 2005 was far from his first attempt to improve others’ lives through learning. He long has championed education for Hispanic children and in 1990 was a founding board member and first chairman of the Hispanic Academic Achievers Program. HAAP has since provided Tri-City Latinos with scholarship money that is expected to surpass a combined total of $1 million this year. Armijo also was one of the founders of Leadership Tri-Cities and the Reading Foundation, both community efforts to improve the welfare of children and adults in the region. He is involved in the United Way, the Washington State Economic Development Commission, Washington State University and the Columbia Basin College Foundation. Gregoire also appointed Armijo to the Washington Learns Task Force steering committee to help improve the state’s education system. Calvin Dudney, the winner of the Tri-Citian of the Year award in 2005, said Armijo joins a list of honorees who started with little but through hard work became community leaders. The definition fits Armijo and makes it perhaps less surprising that he understands the value of education so well. Born to hard-working but not wealthy parents in Pasco, Armijo had to compete for scholarships, get financial aid, apply for grants and work a job to become the first person in his family with a college degree. After graduating from Eastern Washington University with a bachelor’s degree in management information systems, Armijo rose through the business ranks. Now the program director and general manager of Lockheed Martin Information Technology in Richland, Armijo oversees 700 employees and $85 million in federal programs. The Tri-Citian of the Year award is sponsored by the Rotary clubs of the Tri-Cities, with the winners chosen each year by an independent committee. We’re not sure how many Tri-Citians of the Year have been home grown, but it’s certain the ratio favors newcomers. We’ve long been a community populated by folks born elsewhere, and the history of the award reflects that fact. This year, however, the award goes to Frank Armijo, a local production. We’d be hard pressed to come up with a better example of the best the Tri-Cities can produce. He’s a native of Pasco, the son of migrant farm workers, the first in his family to attend college, an alumnus of Columbia Basin College and Eastern Washington University in Cheney. Armijo has since devoted much of his time to making sure more Tri-City students from similar backgrounds can achieve similar successes. Toward that end, Armijo and his wife, Sherry, helped found the Hispanic Academic Achievers Program in 1990. Largely through Armijo’s fund-raising efforts, HAAP is on track this year to exceed a combined total of $1 million in scholarships for Tri-City students. His additional contributions to education include serving on CBC’s board of trustees, helping found the Reading Foundation and sitting on the Washington Learns steering committee, a statewide panel working improve education. Anyone following the successful efforts to establish a four-year university in the Tri-Cities is aware of Armijo’s leadership role in that endeavor. As head of the Tri-City Industrial Council’s higher education committee, he was instrumental in obtaining the Legislature’s approval for a plan to expand Washington State University Tri-Cities. Armijo is program director and general manager of Lockheed Martin Information Technology, and his volunteer work fittingly includes an economic development component. He’s served as chairman of TRIDEC and a member of the boards for Washington Technology Center and the Washington State Economic Development Commission. He was a founding member of Leadership Tri-Cities. Any community would welcome a leader like Armijo. To produce one is a source of pride.